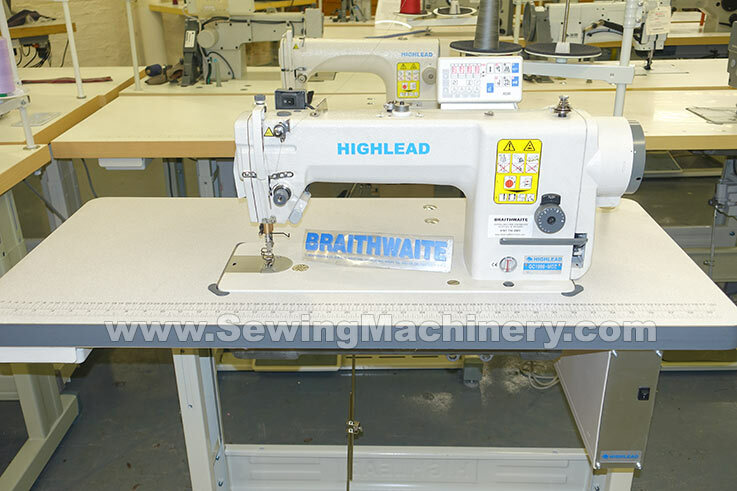 Highlead GC1998 MDZ lockstitch industrial sewing machine with automatic under-bed thread trimmer featuring a direct drive motor system. A powerful compact servo motor is fitted directly inside the sewing machine head which replaces the bulky motor fitted under the table on conventional models. The machine was jointly developed by Highlead & Mitsubishi as a true purpose built direct drive model and should not be confused with adapted add-on style economy direct drive models. 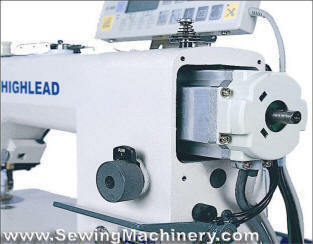 Highlead Direct Drive also eliminates the need for a motor drive belt (connecting conventional table mounted motors to the sewing machine head) offering improved safety with no exposed belts or additional belt guards etc. GC1998-MDZ is equipped with the time served Mitsubishi designed superior automatic thread trimmer system which is mounted under the needle plate for quick & accurate cutting of thread at the end of a sewing cycle. This saves considerable time when compared with manual cutting of threads using scissors etc. The position of the needle is controlled electronically and will automatically put the needle in an UP or DOWN position at the end of a sewing cycle: reducing the need to use the manual hand wheel. This premium model has a longer arm with 300mm clearance to the right of needle, which is around 15% bigger than conventional models, and makes it easier to move and position materials etc. A minimum oiling system has been incorporated which is supplied from a mini lubrication box, which feeds the necessary areas via sealed pipes, and a sealed aluminium sump sheild, which greatly reduces contamination and oil staining of the working area. Efficiency comes as standard with the energy saving servo motor being optimized and only running when you are actually stitching. The motor drive is transmitted directly inside the sewing machine head, with-out a v-belt, further reducing energy loss. 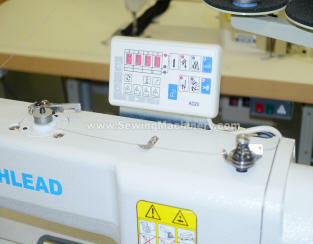 These functions can be set & switched on or off from the included digital stitch control panel. As well as the automatic thread trimmer, electronic functions and wider sewing arm, it still has the standard features which users are familiar with. e.g. : manual reverse lever, stitch adjusting dial, top mounted bobbin winder, hand or knee operated foot lifter etc. 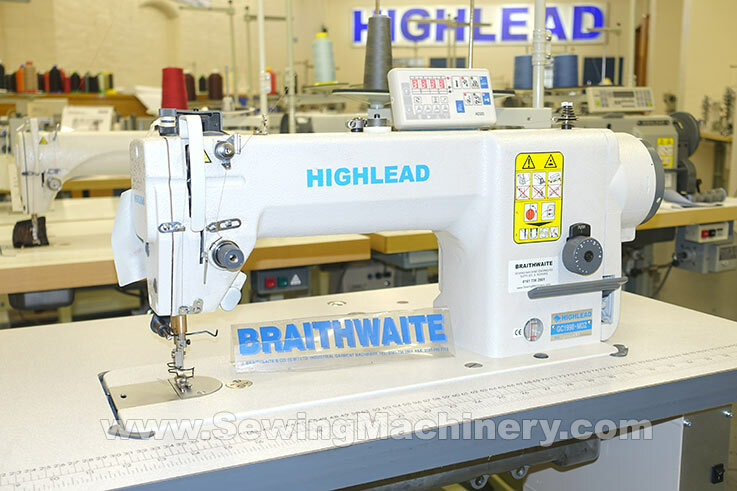 These standard features have also been complimented with the fitting of: a knuckle operated reverse device which is positioned just above the sewing foot area and allows operators to put the machine in reverse with-out having to move their hand to the manual lever. An electric thread wiper controls the thread end after cutting and helps reduce thread bunching-up when you start sewing. An optional automatic electric foot lifter device is available and fits on the back of the sewing machine head (if fitted this replaces manual knee lifter).